I can’t remember every aspect of every single day I have spent working in Barkerville. After all these years most of it is a pleasant blur of images and sounds. But I do remember July 17th, 2000. On the morning of July 17th, 2000 I went to the Visitors’ Reception Centre in Barkerville as I had done many days before and as I have done many days since, to start the morning town tour. As I went inside the building to give a little shout to the gathering guests to alert them that the tour was about to begin, I noticed one of my managers was standing inside. He was looking at me with a very serious expression. He walked right over to me, put his arm gently but firmly around my shoulders, and guided me outside. “Thank you,” was all I could think of to say. I understood why he told me when he did. Even though it was right before a performance, he knew this was what I would want. The rumour mill is impressive in Barkerville, and he knew I would want to hear it first, and to hear it from him, before the information made it through town. I walked out of the VRC in a daze, and somehow managed to dig deep and get on with the show. When the tour ended I asked the interpreter with whom I had completed the tour to come with me to a quiet spot just off the main street, in a small grove of trees, where I told him about Sara. We held each other, wept, gathered ourselves, and walked back downtown to where the rest of our cast was waiting for us. Seven years prior I was hired by Eureka Theatre Company as Street Interpreter. The company was run by a close knit, lovely family. Sara was the daughter of two of the producers. She was nineteen years old when I first met her, and she worked in the Theatre Royal box office. The very next season Sara, a gifted actor, came into the fold as a “streeter” herself. I worked with Sara on the streets of Barkerville for four years, and it was a great pleasure to watch her grow and flourish as an interpreter. I was one of her directors, and I was often a bit hard on her (as I can be with all those in whom I see fierce, raw talent). She met my demands with steely professionalism, wit and a sharp desire to prove herself. She was the bosses’ kid. She knew she had to be great, and she was. Sara played the role of a hurdy gurdy dancing girl named Kate Hartley. We called her “Too Tall Kate,” as she cut a memorable figure with her stature, grace and impressive, constantly swishing hoop skirt. She and my dear friend Brad (who for eleven years played miner Jack Beeman on the street) were cast as love interests in Barkerville, and they were in love in real life as well. In 1997 Sara was diagnosed with a rare form of cancer. In 1998 Sara and Brad were married in a beautiful autumn ceremony in Vancouver. Half of the communities of Barkerville and Wells were there. We danced the night away. It was fantastic. The Barkerville season of 2000 began with us not knowing if Sara would make it through the summer. Our company had contingency plans in place in case Sara and Brad, as well as Sara’s parents and her sister (who also worked in town) had to suddenly leave the Cariboo. We hoped we would not have to use those contingencies… but our hopes were thwarted. Early in July, as Sara’s condition worsened, it became clear that we would need to pull together as a company so the family could head down to Vancouver to do the unthinkable: see Sara through to the end of her life. During Sara’s final months a documentary was made about her, and that, combined with her many years in Barkerville, means that I still get asked about her and her family by visitors on a regular basis. I won’t go into great detail here, but I will say that all of the family is doing well. They are living rich, meaningful lives. Sara’s powerhouse of a mother, my friend Pat, has become a vibrant force advocating for young adults with cancer. She and the rest of her family have made Sara’s legacy count. So this year, as I head out on to the street on July 17th, I will do what I always do. I will remember my friend, Too Tall Kate. As the Theatre Royal bell rings I will remember how she used to swish her hoop skirt along with the chimes so that she herself looked like a big ringing bell. Barkerville has given so much to me over the years, and its greatest gift has been friendship. Sara was my friend. I remember her and I miss her. 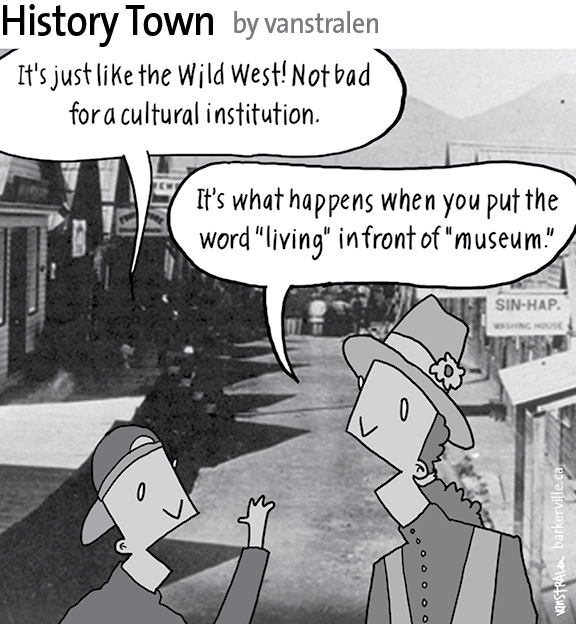 The above one-panel cartoon (originally published July 18, 2015) by Dirk Van Stralen, with accompanying editorial by Danette Boucher, is the seventh of twenty weekly entries that were logged – and subsequently blogged – as part of a 2015 collaboration between Barkerville, British Columbia and the Prince George Citizen aimed at introducing some of the beautiful advantages to living, working, and playing in the Cariboo Goldfields. We hope you enjoy! That was a great and touching story. Barkerville is wonderful.